Illinois State graduate student and Air Force veteran Cassandra Dodge ’14 in the Veterans Study Center, located in 110 Moulton Hall. Redbird Arena will be filled with applause, smiles, and some tears May 7 when Illinois State graduate student Cassandra Dodge ’14 walks across the commencement stage. One loving face will be missing from the crowd—Cassandra’s father, David. So much in Cassandra’s life—her military service, her interest in criminal justice—traces back to her dad. David Dodge was a police officer in Bolingbrook for 25 years before retiring as deputy chief in 2005. An Army veteran himself, he always supported everything Dodge set her mind to. Seven months ago, Cassandra and her family lost David to a heart attack. “There was a really big possibility with everything that occurred that I was (going to be) derailed for a minute,” Dodge said of her father’s passing. 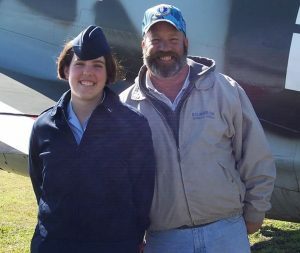 Cassandra Dodge and her father, David, the day she graduated from basic training. But Dodge put her nose to the grindstone to finish her thesis in time and make her father proud yet again. She’ll graduate with a master’s degree in criminal justice, with plans to pursue her Ph.D.
“The fact that I pulled it off in the two-year time frame on top of everything else, and it was quality material, and with a 4.0 (grade point average), with everything going on, that was my proudest accomplishment of the last two years,” Dodge said. Five years ago, Dodge never would have thought she would be on the path she is now. In 2011, she had just finished up five years active duty in the U.S. Air Force. Dodge spent time in 23 countries in less than four years. After a six-month adjustment period, Dodge enrolled at Illinois State as a junior criminal justice major. She finished her bachelor’s in 2014. Now a graduate student, she was one of 530 veterans enrolled this spring at ISU, which ranks as one of the most military-friendly schools in the country. Law enforcement was not always the plan for Dodge, but her father encouraged her to pursue it. “The past semester and a half has been stressful, but he was definitely a huge supporter of my research and a huge supporter of the fact that I was going to be pursuing my Ph.D.,” Dodge said. Since her start as a Redbird, Dodge grew into a dynamic student leader and scholar. She co-founded Veterans at Illinois State and Omega Delta Sigma, a co-ed veterans fraternity; presented research in Portugal and multiple times at the American Society in Criminology; participated with Breaking Barriers, a program meant to encourage females to pursue careers in criminal justice; and earned a graduate teaching assistantship in the Department of Criminal Justice Sciences. “It has been a lot of great networking opportunities and a lot of great interactions with professors. They have all been extremely supportive, both with me academically and me personally, with everything that happened seven months ago. They have been the biggest cheerleaders on top of everything else,” Dodge said. Related Link: Veterans and Military Services This unit in the Office of the University Registrar provides assistance to all student veterans at Illinois State. Even before starting her master’s at Illinois State in 2014, Dodge met two women who would help her reach her full potential. On her first day at Illinois State, she met fellow student veteran Cayla Comens. The two hit it off instantly after bonding over their mutual love for Welsh corgis and their experience in the military. One of Dodge’s professors, Shelly Clevenger from the Department of Criminal Justice Sciences, has always been one of her biggest cheerleaders. She encouraged Dodge to attend graduate school and has since pushed her to work toward her doctorate. “Cassandra is an exceptional student and a pleasure to have in class, but the best thing about her is the kindness that she shows others outside of the classroom. She is always willing to help others and gives her time and energy freely when asked,” Clevenger said. Dodge plans to pursue her doctorate, followed by a career in teaching with a focus on criminal research. Mary Cullen can be reached at mmculle@IllinoisState.edu.